The lampwork glass beads in this piece were crafted by Alexandra Spinglashell of Alex Beads; I love working with her beads because they each seem to have a life of their own, and occasionally I'll find two lonely orphan beads that were clearly made for each other, like the ones in this bracelet! I used .999 fine Karen Hill Tribe Silver beads in plain silver, 24K yellow gold vermeil and 18K rose gold vermeil of various shapes and sizes along with natural yellow jade, amethyst and lapis lazuli beads as well as colored freshwater pearls on sterling silver plated 49 strand flex wire to create this piece. The scrolled hammered clasp is also handcrafted by me. 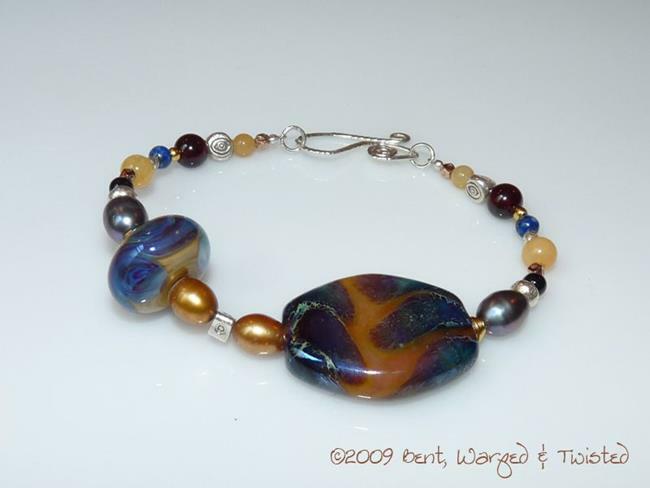 This piece measures 8" long but due to the size and width of the beads fits more like a 7-7 1/2" bracelet.